Coming from the Spanish term sangre azul, "blue blood" derives from the medieval European belief that the blood of royalty and nobility was blue. In more common usage "Blue Blood" also refers to old money families that have been aristocrats for many, many generations. In America, these "blue blood" families include the Rhode Island Pells Chaffees and Whitehouses, the Cabots, Lodges and Saltonstalls of Massachusetts, as well as the Astors, the Vanderbilts, the Rockefellers, the du Ponts and the Carnegies. The last of these, Andrew Carnegie was a 19th century steel baron who, upon his death in 1919, gave away an estimated $370 billion (in 2017 dollars) to charity. One of his partners, George Lauder - who was also Carnegie's cousin - held on to his money and bequeathed it to his children. One of these children, daughter Mary Josephine "Polly" Lauder, inherited an unfathomable amount of money. She would become a doyenne of high society, marry the World's Heavyweight Boxing Champion, Gene Tunney (the "Fighting Marine") and bear several children. 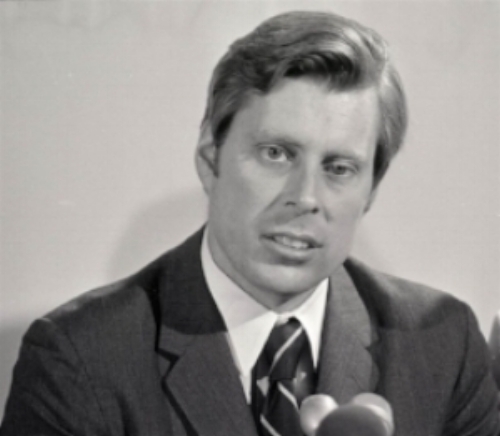 One of their sons, John Varick Tunney (born in 1934), who would become both a three-term member of the House of Representatives and a one-term United States Senator from California, died a week ago at age 83. Not only was he the living, breathing definition of a Blue Blood; he was also a progressive, an important environmentalist, and both a friend and political mentor of mine . . . When I first met John Tunney, he had just been elected senator after having served three terms as a Representative from a California district which included Riverside and Imperial County - about as far away from Blue Blood land as one could get. John Tunney was raised on a 200-acre estate - "Star Meadow Farm" - near Stamford, Connecticut, and was the product of prep schools (New Canaan Country School and Westminster Prep), Yale, and law school at both the Hague and the University of Virginia (where his roommate was childhood friend and future Senator Edward Moore (Ted) Kennedy. Despite this highly privileged background, John would become one of the most progressive senators of his era. In his first term ( 1970-72), Senator Tunney wrote and passed an unbelievable 38 bills - next to impossible for a freshman. And these bills weren't the normal kind of 1st year bills like the naming of post offices or a private bill guaranteeing benefits for a veteran. These were bills dealing with environmental protection (he played a pivotal role in passing the original Endangered Species Act), civil and voting rights and noise pollution. He also took a leading role in keeping the United States from becoming entrapped in the Angolan Civil War. Because he spent so much time working on - and passing - seminal legislation, voters in California concluded that he didn't really care all that much about them; as a result, Senator Tunney was defeated for reelection in 1976 by S.I. Hayakawa, a former president of the University of San Francisco and a political novice. (It has long been presumed that Tunney was model for the Robert Redford roll in the 1972 film The Candidate). Saying "There is nothing sadder than a 42-year old former senator hanging around Washington," Tunney returned to California where he joined the most politically prominent law firm in the state (despite the fact that he really did not need the money) and became involved in environmental causes such as Living with Wolves, an organization dedicated to raising consciousness of the animals' importance. For many years he headed the board of the Hammer Museum at UCLA. And spent time traveling the world and living variously at homes in Brentwood (CA), Manhattan and Sun Valley, Idaho. At the time I first met John Tunney and his family (including his son Edward Marion "Teddy" Tunney, named after Senator Kennedy), I was helping a group of anti-war members of Congress prepare for the upcoming "March on Washington." A mutual acquaintance got me lodging at the senator's home on Tracy Place in Georgetown. During my time with him, we spoke quite a bit about war and peace, books (his father the fighter was notorious for reciting Shakespeare in between sparring rounds) the nature of politics and the importance of forging alliances with "the people on the other side of the aisle." He also strongly urged that if I eventually decided to make a career in politics, it would be best to remain "in the shadows" rather than run for office. "In that way," he told me more than once, "you can at least go home at night, get more things done, and step into a restaurant without being besieged." Of the many political folks I've had the fortune to be associated with over the past 5 decades, Senator Tunney - despite his background - was one of the most down-to-earth. There was scarcely a hand-breadth between his public and his private personae. Despite being a political powerhouse, John Varick Tunney was truly humble. He had it all . . .and gave the world his all. 373 days down, 1,184 days to go.